Let me first write a bit about the overall concept. For info about this specific event, jump to “The Saturday” below. PyLadies CZ is an informal group of people that (among other things) organize 3-month Python courses for women (mostly beginners). These courses have been going on for about 5 years in Brno, and have heavily influenced the workshop, so let me write a bit on how they're organized. The organizers are alumni of past courses – the very people that want to learn make the courses happen possible. They coordinate sign-ups, make sure they have a room with internet access, respond to questions, and so on. The lecturer knows the material deeply and comes to teach. Often, this is done by external people – often it's my role, and I'm not a PyLady :) Thanks to the organizers, the lecturer doesn't need to deal with logistics, registration or catering, and can focus on transferring knowledge. And then there are coaches, something like teaching assistants – people who help attendees with individual problems. These can be experienced programmers, or people who have gone through the last semester's course and are just a bit ahead. Most of what the coaches do is trivial: finding mismatched parentheses, files saved in wrong directories (or not saved at all), or typos. Since it's perfectly OK for a coach to not know something (they can always ask someone more experienced), this is a great opportunity for alumni to see how much they learned since they were complete beginners. And since the role needs no preparation, it's a great way for anyone to give a few hours back to the community. The whole thing is free for attendees, volunteer-organized, and budget-less (companies are happy to provide a venue with internet, and while there are minor expenses like sticky notes or candy for prizes, they usually aren't worth the paperwork to get expensed). It's also fully open – teaching materials are available to anyone to go through or adapt. This semester, PyLadies CZ are planning to run 7 forks of the beginners' course in 4 cities (see pyladies.cz). Organization in each city is relatively independent. The full-day event we had on Saturday is a relatively new addition to the “curriculum”. 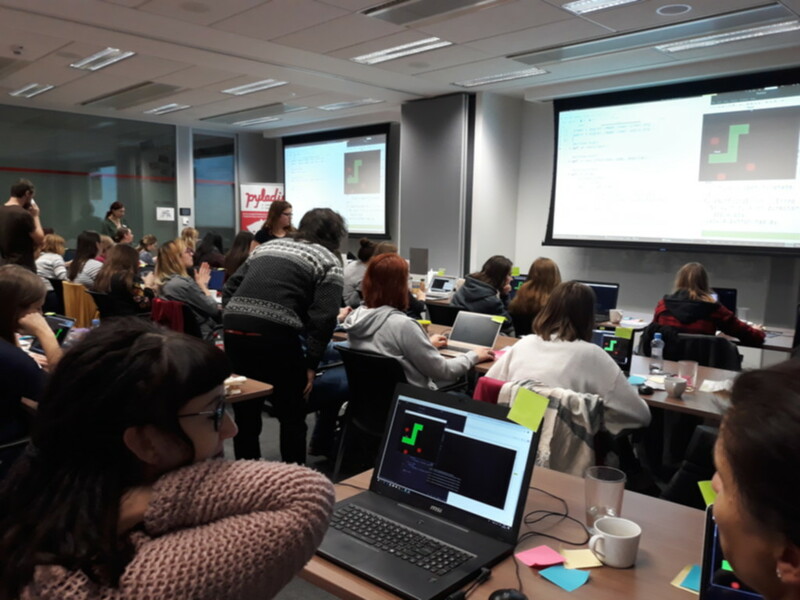 It's modeled after the very successful Django Girls workshops, where attendees who haven't programmed before build a web application (a blog) in just one day. The Snake workshop has beginners make a game (Snake) in just one day. 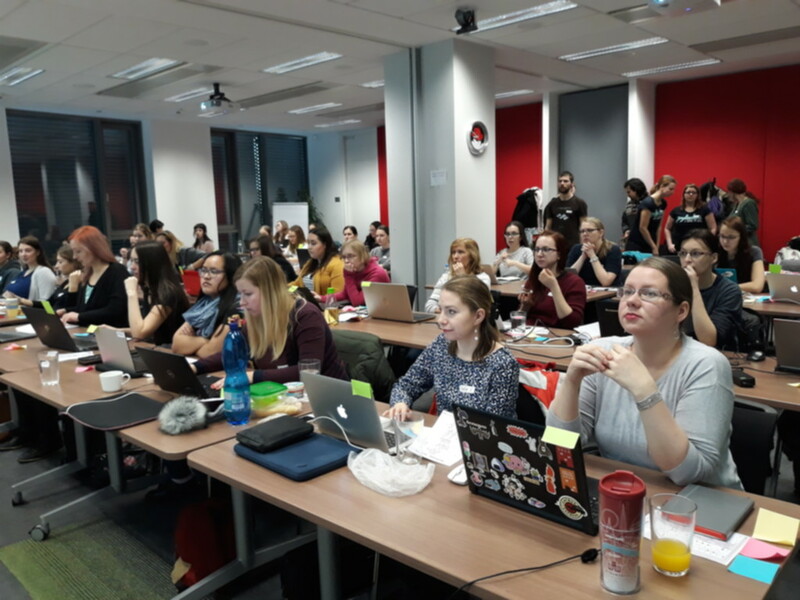 Similarly to Django Girls workshops, the Snake workshop targets complete beginners – prerequisites are on the level of installing Python, unzipping an archive or sending an e-mail. There are less technologies to learn: rather than Python, HTML, CSS and databases, there's Python and a bit of graphics. Give people an overview of what learning programming looks like – hopefully, the message is that it's fun and rewarding, but that it will require lots of time. Filter out people who'd drop out after the first few lessons of the course. Give an overview of Python's the basic data types and building blocks, which should be helpful because the 3-month course is “bottom-up” (introduces elementary concepts and builds on them), so the “big picture” only reveals itself near the end. 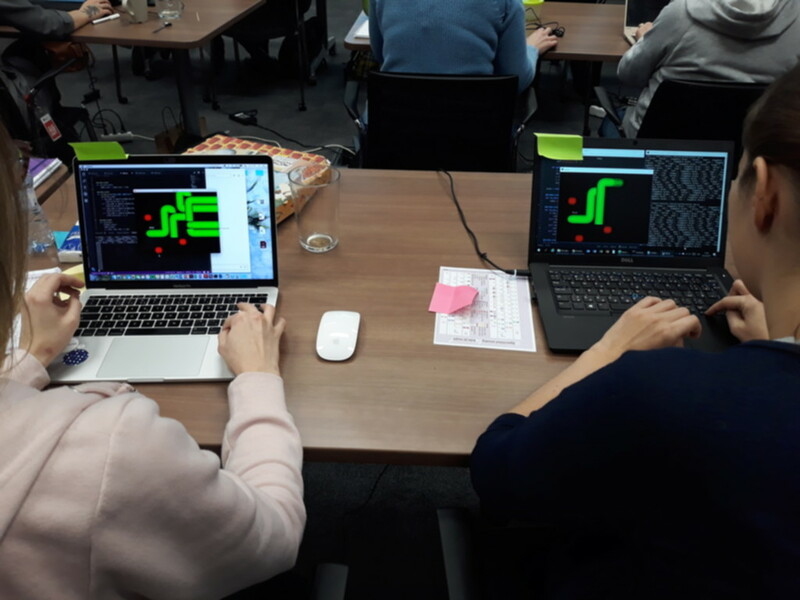 The last instance of the Snake workshop happened on Saturday, February 2nd. 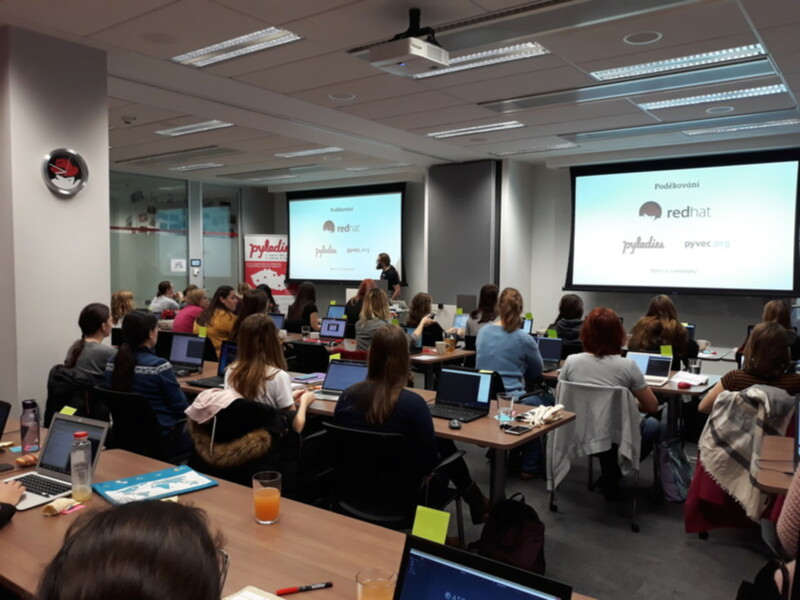 This was the 4th run so far (after the first trial for PyLadies in Hradec Králové in March 2018, one for PyLadies Brno in September 2018, and one open for anyone in October 2018). For this workshop, Red Hat provided the venue (Plutonium & Neptunium meeting rooms in the TPB-C office) and food (of which there was a lot; thank you!). 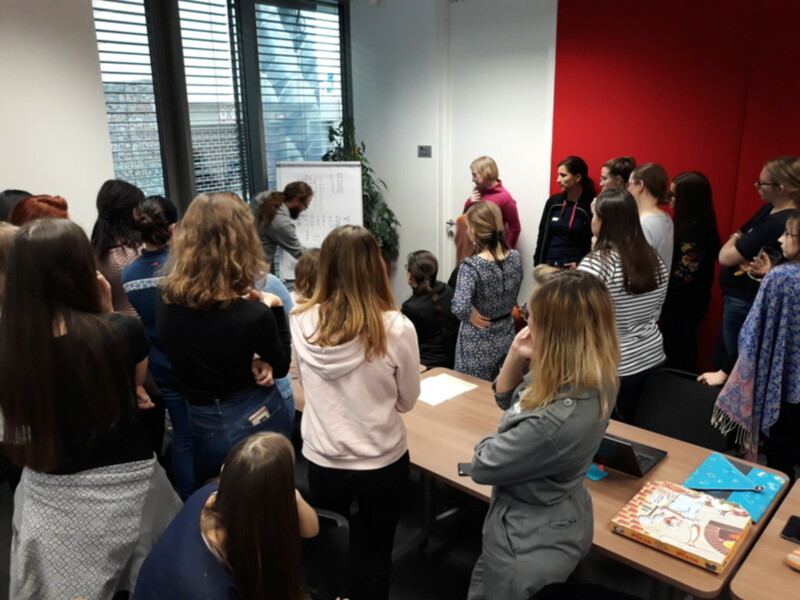 We spent the morning (well, until 14:00) explaining basic concepts (numbers, expressions, strings, functions, conditions, lists, dicts, imports, loops, …) and the afternoon with the game. Based on the feedback to date, everyone enjoyed the show. There were smiles throughout; the coaches were kind and helpful, and I'd say the attendees learned as much as they could in a day. Also, there was too much food in the end. We had a generous sponsorship from Red Hat and people ordered their own lunches. This one is entirely on me as the link between the sponsor and the organizers; next time I will coordinate better. Finally, I did not request spare laptops in time. Usually, Red Hat Regional IT is happy to lend a few out-of-warranty machines, which are very helpful when some attendee's computer stops working, turns out to be too slow, or has glitchy graphics. I forgot to request them in a reasonable time, so we didn't have them. Thankfully, they weren't needed – but hardware problems could have ruined the atmosphere of the workshop. It ticks the tree factors of intrinsic motivation: autonomy (deciding what to teach and what to leave out in a time-limited workshop), mastery (working on something that can always be improved) and purpose (helping people understand my passion, not to mention the whole “underrepresented minorities” thing that I'm not really going into here). 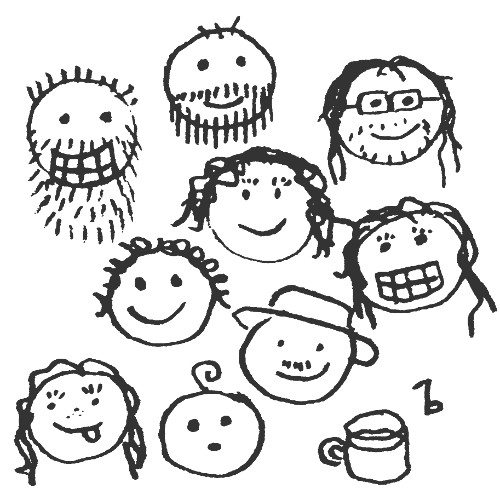 Anyway, I was throroughly exhausted at the end, after ten hours of live coding. I think I'll wait a few months before doing this again. Thank you to everyone involved – the organizers, the coaches, Red Hat GWS & BIPI, and the attendees. Let's do more of these!